A 3D laser scanner is a device that collects precise spatial data of objects or environments. The collected point cloud data can then be used to construct digital three dimensional models. ZOOM 300 is a high performance, easy to use, complete solution for all 3D survey requirements. Manufactured to withstand adverse conditions, the design is also lightweight and portable. ZOOM 300 is a rugged and reliable Time of Flight Laser Scanner recommended for all working environments, especially topographic surveys. The sealed casing protects the internal components, providing an IP65 dust and waterproof rating. ZOOM 300 is simple to use and ready to scan at the press of a button. The scanner can be controlled and operated directly from all mobile devices with a WLAN connection. A menu driven interface makes selection straightforward. ZOOM 300 supports four scan modes at different resolutions. Depending on the object and the area to scan, the user can define the best resolution to optimize scan time and the size of data output. The scan time varies according to the scan mode. 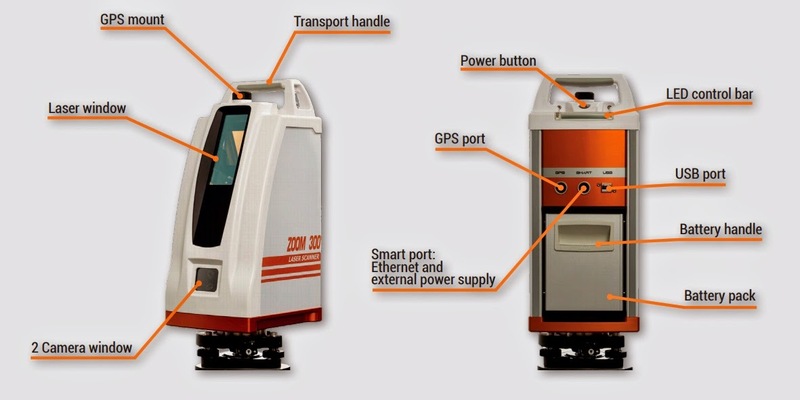 To operate the ZOOM 300 Laser Scanner, all you need is a PC, Tablet or Smartphone with Wi-Fi and a web browser. You do not even need to install any drivers or software, since the web interface server is built into the scanner. A new concept in software for processing topographical data, capable of integrating a variety of different information, including: import of all common data formats, calculations, scan registration and management of the point clouds and photography, topographical drawing functionality. Simplicity and interactivity all in one application! It is now possible to use a GPS/GNSS receiver to calculate the position of the scan and georeference the point cloud data. A GPS/GNSS antenna can be mounted on the ZOOM 300 and orientation can be calculated from a reference target with known coordinates using a second GPS/GNSS receiver. The equipment ensures accuracy and precision for all 3D projects using a single 3D reference system. Framework is a Laser Scanner support accessory particularly useful for the scanning of closed environments such as caves, architectural structures and tunnels, where ceilings are particularly high. This accessory allows the scanner to perform a full surface scan through a rotation of 240°.